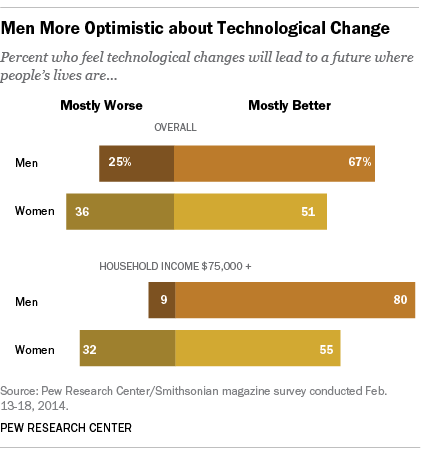 1Men, especially those who are high-income and highly educated, are generally more optimistic than women are about the long-term impact of technological change. Overall, men have a more positive outlook than women have when it comes to the impact of future technological and scientific developments. Fully 67% of men (compared with 51% of women) said that technological changes will lead to a future where people’s lives are mostly better. Meanwhile, 36% of women (compared with 25% of men) expect those changes to make society worse. These gender differences are especially pronounced among Americans with high levels of income and education. For example, men with an annual household income of $75,000 or more are overwhelmingly positive—80% expect changes in technology to make life better, while just 9% expect them to make life worse. Conversely, women in this same income group are much more divided on this question—just over half (55%) expect a better future thanks to technology, but a third (32%) envision a negative impact. We did not ask our respondents to tell us why they feel optimistic about the future of technology, but it is certainly the case that men dominate some of the career fields that will be building the technologies of tomorrow. According to a 2013 National Science Foundation report, women made up 44.5% of the overall workforce in 2010, but just 25% of mathematical and computer scientists and 12.7% of engineers. Interestingly, in light of their divergent opinions about future technologies, we found in a survey conducted earlier this year that men and women have nearly identical attitudes about the current impact of the internet of today. Fully 90% of both men and women said that the internet has mostly been a good thing for them personally, and 79% of men and 73% of women said that it has mostly been a good thing for society in general. 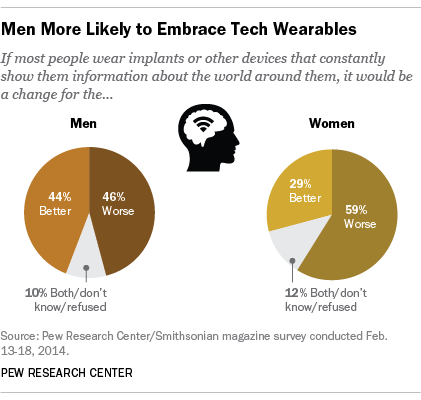 No issue in our survey divided men and women more than the following question: “Would it be a change for the better or a change for the worse if most people wear implants or other devices that constantly show them information about the world around them?” Men’s attitudes are evenly split (44% think it would be a change for the better, 46% think it would be a change for the worse), but women overwhelmingly feel (by a 59%-29% margin) that this would indeed be a negative development. A number of recent articles and discussions have called attention to the ways in which women can feel threatened or otherwise unwelcome in today’s digital world in other contexts. 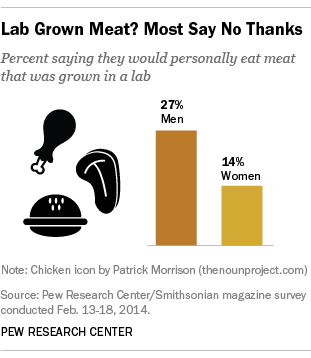 3Men are more willing to try lab-grown meat. From Soylent Green to The Jetsons, science fiction has long pondered the ways in which food in the future will be different from what we eat today. Contemporary scientists are developing new methods of meat production that might meet the world’s rising desire for animal products without the environmental impact of modern agricultural methods. In late 2013, scientists produced the first beef patty grown directly from stem cells in a lab. Commercial production of lab-grown animal products remains on the horizon (the 5 oz. lab-grown patty costs more than $300,000 to produce), and consumers may need time to come around to the idea—just one-in-five Americans would like to eat meat that was grown in a lab. However, men are twice as receptive as women—27% of men and 14% of women would be willing to give it a try. It’s a long-standing stereotype that men will eat anything, but this statement does seem to contain at least a grain of truth. An epidemiological survey conducted in 2007 found that men were more likely than women to eat meat in general, and that they were also more likely to consume various “risky” foods such as undercooked hamburger. 4Despite their differences, men and women share a number of similarities about their outlook for the future. Although women have their own unique fears and expectations about the future of science and technology, the genders are united when it comes to certain issues. Equal shares of men and women believe that it would be a change for the worse if parents alter their children’s DNA to produce better genetic outcomes, and neither men nor women are eager to live in a world in which robots serve as the primary caregivers to the sick and elderly. Similarly, both genders are skeptical that humans will be able to control the weather or colonize other planets, and are equally optimistic about the prospect of computers creating important art (51% of both men and women say this would definitely or probably happen). And seven-in-ten of both genders say that they are not interested in getting brain implants, even if it could improve their memory or mental function.